Paraguay, 21 September 2010 – A worldwide coalition of environmental and indigenous groups warns that international policies governing responses to climate change still promote monoculture tree plantations as a solution, despite their negative impacts on biodiversity, water resources, local communities and the climate. Today – International Day against Tree Monocultures  – the Global Forest Coalition urges governments, companies and international institutions to end promoting a land-use that has proven to be socially and environmentally disastrous. “Tree plantations grown on community land in the global South provide cheap raw materials – timber, pulp, rubber, palm oil or biomass – for countries in the North while causing environmental degradation and increasing poverty in the producer countries” says Fiu Elisara, chair of the Global Forest Coalition. “International institutions including the FAO and the World Bank falsely define industrial tree plantations as a type of forest”, says Wally Menne of Timberwatch in South Africa. 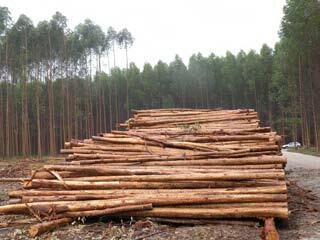 The promotion of agrofuels and bio-energy from wood is currently leading to an increase in forest plantations. In December 2008 the European Commission (EC) approved a target of 10% renewable energy use in transportation by 2020, which has led to greatly increased agrofuel production, including woody biomass. “The increasing demand for wood-based bio-energy is driving the expansion of plantations in developing countries, where land-grabs by foreign companies are displacing community food farmers and forest peoples from their traditional territories”, says Simone Lovera, executive director of the Global Forest Coalition. The global timber industry claims that tree plantations can play a significant role in mitigating climate change, by sequestering atmospheric carbon. However, studies show that real forests store much more carbon than plantations, which are usually temporary, quickly releasing the carbon back into the atmosphere after they are cut down and the logs processed into throw-away commodities like disposable nappies and tissue paper. Large-scale, fast-growing tree plantations destroy natural vegetation and cropland, degrade and erode soils, and together with the use of chemical fertilizer and herbicides, cause the release of large volumes of greenhouse gases.